Billionaire, Aviation Pioneer Announce Commercial Spaceflight Venture : The Two-Way Stratolaunch Systems is a new venture from Microsoft billionaire Paul Allen and aviation pioneer Burt Rutan that plans to launch rockets into space from a specially built jet aircraft with a wingspan greater than the length of a football field. 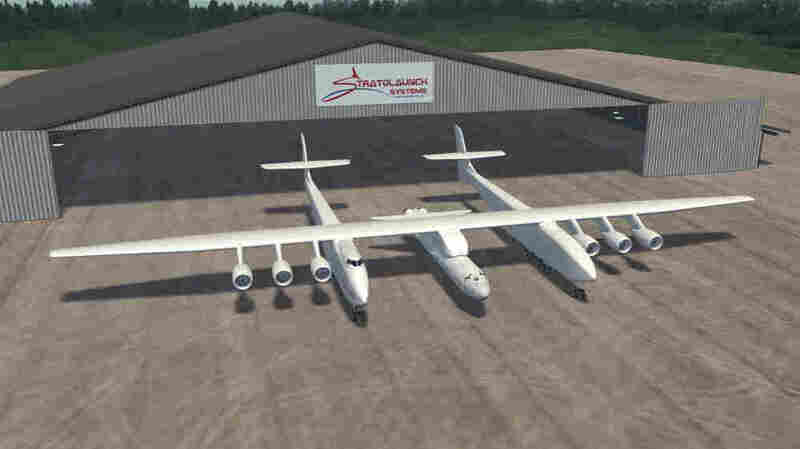 A computer-generated image provided by Stratolaunch shows the planned carrier aircraft, with a rocket attached on its centerline and six jet engines suspended beneath its wings. Remember when the space shuttle — aka "space truck" — was going to make make trips into Earth orbit a routine thing? It really didn't turn out the way people had hoped. Now there's a new pretender to throne, another team ready to try and make bring flights into space a little closer to an everyday reality. Stratolaunch Systems is a new venture from Microsoft billionaire Paul Allen and aviation pioneer Burt Rutan that plans to launch rockets into space from a specially built jet aircraft with a wingspan greater than the length of a football field. The company and its partners hope to test the system starting in 2016. If successful, they will first send commercial payloads into space and then, about five years later, they hope to add human spaceflight to their capabilities. The Huntsville, Alabama, based company says that it's goal is to offer "any orbit, any time" to paying customers. "The giant carrier aircraft designed to transport the rocket into the air will use six 747 engines, have a gross weight of more than 1.2 million pounds and a wingspan of more than 380 feet." "Requiring a runway 12,000 feet long to take off or land, it will operate from a large airport or a spaceport, such as Kennedy Space Center, and will be able to fly up to 1,300 nautical miles to the payload's launch point, according to the advance materials provided by Allen's investment company, Vulcan." "Huntsville aerospace company Dynetics will be responsible for the technical integration of its systems. The ultimate goal of the company is to put humans in space, Allen said today." "Besides Dynetics, a booster developed by SpaceX Technologies in California will power the new rocket, a modified version of its Falcon 9 launch vehicle. Scaled Composites, a company founded by commercial space pioneer Burt Rutan, will build the plane to carry the rocket aloft to the launch point." "Allen bemoaned the fact that government-sponsored spaceflight is waning and said his new project would 'keep America at the forefront of space exploration' and give a new generation of children something to dream about." Allen and Rutan previously worked together to capture the Ansari X Prize for building the first private craft to fly into space. In 2004 their effort resulted in a prize-winning suborbital flight by SpaceShipOne. The craft was then retired. But a follow-on effort by another billionaire, Richard Branson, seeks to push its design forward with SpaceShipTwo and commercial operation through Virgin Galactic.